Born in Osaka Prefecture. After graduating from Kyoto City University of Art, Department of Japanese Painting, he found work as a graphic designer for an advertisement agency. He began making collages while recovering from illness, and continued to create prints from there. In 1968 he was selected to present at Japanese Contemporary Art Exhibition, andh the following year, held a solo exhibition at Kinokuniya Gallery. Beginning with the 2nd England International Print Biennale where he was awarded the Memorial Prize, KIMURA exhibited in many places around the world, like the São Paulo Biennale and the Ljubljana International Print Biennale. 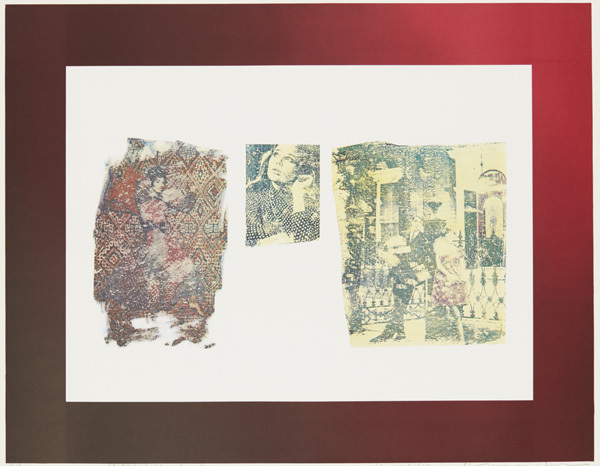 He worked with many mediums, particularly focusing on photolithography, and even more specifically, silkscreen collage. He has works like murals, monuments, and sculptures in many places included Osaka University, Ibaraki City Office, and Kobe International Culture Hall. KIMURA began to work as a professor at Kyoto Institute of Technology in 1987, and acted as President from 1998 to 2004. If you have any question, an artist of interest, or a work you are looking for, please write in the box below. We will reply to you as soon as we check our stock. Copyright(c) 2016 TOKI NO WASUREMONO / WATANUKI INC. All rights reserved.